Last week on XBLA saw not one, but two titles published by indiePub. The first was Storm (check out our review for Storm here) and the second is Fireburst. They're basically at opposite ends of the spectrum, as Storm is wonderful and peaceful, yet Fireburst is a testosterone fuelled, fire-heavy arcade racer. The range of games really shows that indiePub are willing to try out a lot of different things, and it's awesome. Anyway, Fireburst released last week for the measly price of 800 Microsoft Points, but is it so cheap because it isn't too good? Read on to find out! Fireburst is split into three very distinct modes, which offer more than the average racer. You have the Race mode, which needs no explanation. The races in Fireburst are properly insane, and the mix of intense speed, long tracks with numerous paths, and the Fireboost will definitely have you on the edge of your seat until you turn the thing off. The Fireboost is basically a boost, but with a difference. You don't earn the boost, and you don't run out of boost, it's just always there (bar the first ten or so seconds of the race/challenge), waiting to be used. Use it at your own peril though, as hold it down too long and you're certain to explode in the most over-the-top suicide ever seen in a racing game. It's like Excitebike's pyromaniac cousin, and players of the old NES classic will probably have an advantage in Fireburst. There are different types of Fireboost to check out, such as one which creates a fire ring around your car, then explodes on release, or one which leaves fire in your tire tracks, which works great on a narrow road as everyone behind you has no escape. 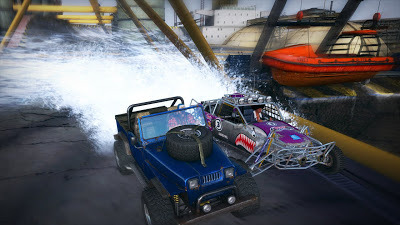 To help you use extra long boosts, you can drive through puddles, under waterfalls or into barrels. There are two types of barrel in Fireburst: Water and Fire. The red Firebarrels give you a sudden surge of heat, which is never good. Avoid these at all costs. The Waterbarrels are like a lifeline, cooling you down when you're on the verge of exploding. So as well as finishing the race in first, you must try to avoid your opponents attacks, and dodge Firebarrels. Cool down to keep the boost going! Another mode is the Fireburst Racing League, which is a series of challenges. This seems to be the "story" mode, if you will, the single player experience. One thing you should know about the Racing League is that it gets stupidly hard, quite fast. The challenges are all very different, and are given to you by eight characters. They all give a different style of challenge that is suited to their look, like the nerd guy who excels in engineering gives a time travel challenge, or the racer who modifies cars to be super fast. They're fun to try out, but maybe a little too hard for a lot of gamers, and there is no replay value at all in this mode. And last, but certainly not least, we have Destruction mode, which is again self-explanatory. Set in a variety of arenas, this mode is probably the most fun you'll have on Fireburst, as you try to destroy your opponents using your Fireboost attack, or just brute force. It gets pretty hectic and you'll have a giant grin the whole time. Taking someone down is so satisfying. There are online Races and Destruction games too, but considering I could not find a single person to play online with, there's not much to say about it, so if you're after multiplayer, this is not the game for you. The handling of the cars is really good, the steering and brakes are responsive and before you know it, you'll be drifting around corners and activating your Fireboost at the ideal moment to take someone down. Even though it feels like you're driving at light-speed, you won't crash as often as you would expect and it's pretty easy to win the races from the start. It's the challenges that need a good level of experience to tackle. Graphically, Fireburst is pretty good. Nothing stands out as a graphical accomplishment, but they look good enough for the price tag. So that's Fireburst. If you're interested in a fast-paced arcade racer, this could be the game for you! 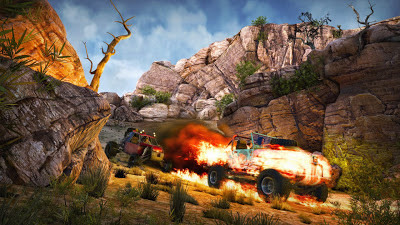 Destruction and Races are the modes that will take most of your time, and if only there was a bigger online community (or an online community at all), Fireburst would be much more desirable. Despite it's flaws, I had a lot of fun with Fireburst. It may not be the most polished title on the Xbox Live Marketplace, but it would be a real shame if it flopped, as much worse titles have done a lot better than Fireburst seems to be doing.